Turn everyday experiences such as waiting in lines, doing errands, and driving in the car into conversation starters. Talking with your child, you can learn about his/her ideas, observations, and feelings. 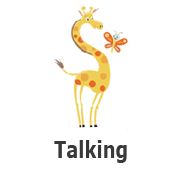 This prepares your child for conversations, oral language and vocabulary building. Make up silly rhymes as you go about your day. Rhyming and other kinds of word play help your child to hear differences between sounds to understand that words are made up of letters and sounds. Rhyming is silly, fun and great for oral language and vocabulary building. Talk with your child about his/her day, your day, special family outings, school or work. One way to support your child’s vocabulary, interest and curiosity is to plan family outings around town or far from home. A walk to the local park or playground can become an opportunity to observe and discuss what you see, animals, or nature. A trip to the zoo can become an opportunity for your child to learn unique vocabulary words such as "hibernate," "ferocious," and "distinctive."